Basic research into the mechanisms of cell division, using eggs and embryos from frogs and starfish, has led collaborating researchers at the UO and University of Wisconsin to an unexpected discovery about the way animal cells control the forces that shape themselves. During a key point in cytokinesis — when a cell divides its cytoplasm to create two daughter cells — a cell's cortex becomes an excitable medium. The finding is detailed in a paper placed online ahead of print by the journal Nature Cell Biology. That cytokinesis is highly dynamic has long been known, but exactly how and when the crucial event driving it occurs has been a mystery, said co-author George von Dassow of the UO's Department of Biology and Oregon Institute of Marine Biology in Charleston, where much of the research was done. "After it happens, the cell has literally ripped itself in two," he said. "The contractile machinery that makes this happen is quintessentially ephemeral." What hasn’t been obvious, he said, is how the cell manages to ensure that the entire surface can participate, but, once specified, only one narrow equatorial band leads the way. The cell surface enters an excitable state just after chromosomes separate deep in the cell cytoplasm. At that point, von Dassow said, waves of signaling molecules form. They appear to function like an amplifier, tuning in faint signals from deep in the cell to accurately and precisely delineate the working conditions for contractile proteins and other enzymes to assemble at the right place, in the right amount and at the right time during cell division, or, as the research team theorized, during other important cell-shape changes. This "cell-cycle-entrained behavior" in the cortex — a thin layer of organized cytoplasm associated with the cell membrane — is present in vertebrates and invertebrates, the researchers show in their paper. "Systems as diverse as microbial populations, cardiac muscle cells, the inflammatory response, and even defined chemical mixtures, may exhibit excitability, which has long been an interest to mathematicians," von Dassow said. "High-resolution live-cell imaging combined with mathematical modeling suggests how this dynamic behavior might be used by cells to accurately and adaptively manage their contractile machinery." The discovery emerged from work being done under two National Science Foundation grants to the UO's von Dassow and a National Institutes of Health grant to co-author William M. Bement of the University of Wisconsin-Madison. 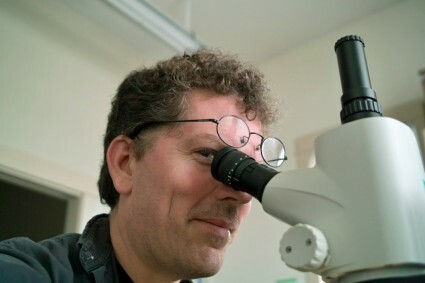 "We are longtime collaborators, and it just happened that two threads of research accidentally converged on what turned out to be a similar phenomenon in both frog eggs and embryos, and starfish eggs and embryos," von Dassow said. Andrew B. Goryachev of the University of Edinburg in the United Kingdom, a mathematician and specialist on excitable dynamics, also was a key contributor to the research.